Beviamo is a 42 foot (12.9 metre) luxury yacht built in Germany. 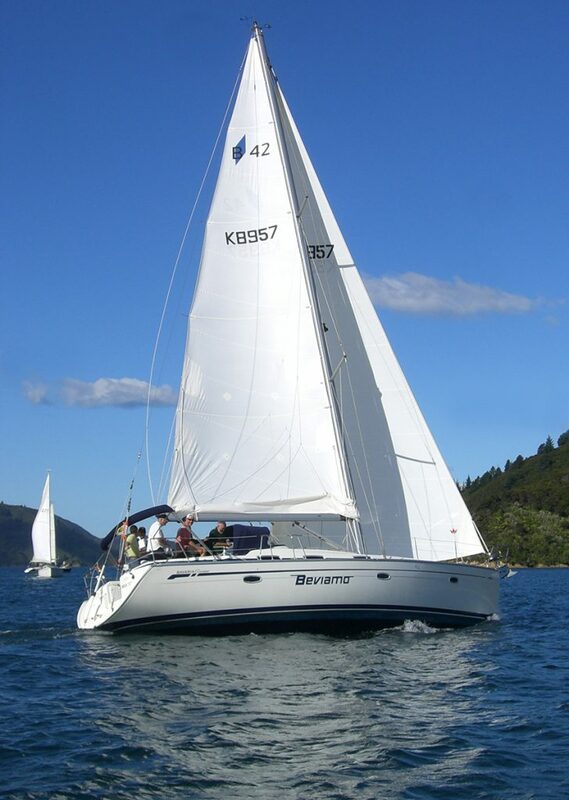 Beviamo was specifically purchased for luxury charter work in the Marlborough / Nelson area. Beviamo is fully surveyed to Maritime NZ Safety Authority specifications. Hire of Beviamo comes complete with its qualified skipper who is licensed by Maritime NZ. Your skipper has been sailing in the Marlborough Sounds for over 55 years. His long association with the area means he can show you the many exciting places that make the Marlborough Sounds so special. Beviamo has a twin helm, meaning it has two steering wheels, making it ideal for people who want to try their hand at sailing, in the knowledge that support is close at hand. Sail training is our specialty. Hire costs are $400 for first hour, $100 per hour thereafter. Hire includes skipper, fuel and complimentary tea / coffee / cold drinks. Bring your own alcohol and food if you wish. Catering options are available at additional cost. Overnight accommodation on board Beviamo is limited to 4 people, with two luxury cabins available. Further accommodation can be arranged for additional guests on shore at one of the many lodges or resorts if required. Additional costs would be payable by hirer. With a selection of great music to choose from, you can cruise the waterways of your choice in style and comfort. Food is not provided in the hire fee, but there is a galley (kitchen) on board for you to prepare the food that you have brought, or alternatively there are several quality restaurants to choose from, within a comfortable cruising range. Your skipper is not too bad in the galley if you would like your food cooked for you. All prices include; skipper, fuel, lifejackets, safety equipment and use of Beviamo inventory including linen, BBQ etc.